Photo: Just another beach sunset. Chaung Tha Beach, a quiet Bay of Bengal coastal beach town, is a long stretch of sand that’s home to some of Burma’s most affordable beachfront accommodation. It’s popular with weekend beach goers from Yangon with a slow but steady flow of Western travellers. The vast shoreline provides plenty of refuge, perfect both for couples seeking a peaceful romantic getaway as well as for solo travellers looking to unwind quietly. If it’s a party beach that you’re after then this isn’t your place; however, if you’re looking for the kind of venue that’ll allow you to read through the stack of books that’s been weighing your backpack down, or clear off your e-book to-read list so you have an excuse to download more, then this is a beach for you. Chaung Tha has a range of accommodation options, ranging from simple no-frill hotels across the road from the beach to high-end luxurious beach resorts with swimming pools, fancy restaurants and on-site spas. In general though, Chaung Tha is cheaper than nearby Ngwe Saung Beach. Additionally, the resorts are much closer to one another, making it easier to interact with locals and other travellers. Evening beach football matches are common, with locals more than happy to let foreign travellers join in. Because of its natural beauty and proximity to Yangon, Chaung Tha has considerable potential to become one of Burma’s major tourist destinations. At the moment, however, the town is very much underdeveloped. Footpaths are in bad shape and there’s no electricity; the resorts must rely on power generators at night. The situation appears to be changing and many of the town’s hotels are expanding or have plans to add additional rooms. 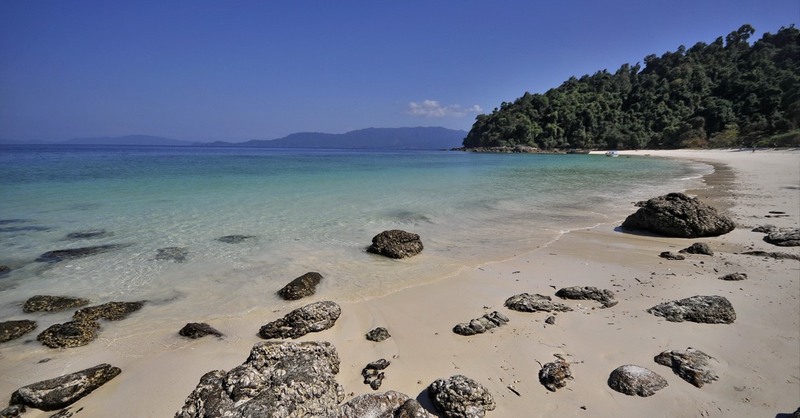 The beach is accessible via bus from Yangon and is a five- to six-hour ride. Be warned, though, that the second half of the journey consists of sharp twists and turns through some of the steepest groups of rolling hills in the Ayeyarwady Delta. Motion sickness pills are available at the bus station. Chaung Thar Road runs parallel with Chaung Tha Beach. The majority of the hotels and bungalows are beachside and across the road you’ll find several restaurants, simple convenience stores and souvenir shops. A small town and market area is near the southern end of the beach and is an easy 10-15 minute walk from any of the resorts. The going rate for a motorcycle taxi anywhere in town is 500 kyat per ride. There are no ATMs in Chaung Tha Beach so bring enough cash with you. Several of the guesthouses in town offer free WiFi. If you’re already in town and internet access is essential, it may not be a bad idea to test the guesthouse’s WiFi before you agree to book the room. The restaurant located inside of the Shwe Hin Tha Hotel offers reliable WiFi to both hotel and restaurant guests. The shops across from the Golden Beach Hotel sell umbrellas (a necessity during rainy season) for 2,000 kyat. ’Chaung Tha Beach’ souvenir T-shirts are also available for just 1,500 kyat. In that area you’ll also find a very basic pharmacy selling a small selection of medicine and toiletries. Browse our independent reviews of places to stay in and around Chaung Tha Beach. Read up on where to eat on Chaung Tha Beach. Check out our listings of things to do in and around Chaung Tha Beach. Read up on how to get to Chaung Tha Beach. Planning on riding a scooter in Chaung Tha Beach? Please read this. Use the above map to find specific destinations in and around Chaung Tha Beach which are listed on Travelfish. Bed icons indicate a guesthouse, hostel or hotel, the knife and fork is an eatery or bar and the four-way circular thingy marks sights, attractions and other points of interest. Click on any icon for a short pop-up and a direct link to the page for that spot. If you are in the area, use the teardrop icon near the top left to show your position on the map (you'll need to allow position sharing for this last feature to work).